(Beyond Pesticides, March 25, 2019) EPA is using a regulatory loophole – the “treated articles exemption” – to allow systemic insecticides to be used in mass quantities, without regulating or labeling them as required under the Federal Insecticide, Fungicide and Rodenticide Act (FIFRA). EPA does not currently assess adverse effects on the environment and public health caused by widespread use of neonicotinoid insecticides delivered through seeds coated with the insecticides, resulting in widespread exposure to one of the most environmentally damaging classes of chemicals on the market. Tell your Congressional delegation that EPA must fully regulate treated seeds to protect the environment and public health. Pesticide-coated seeds are now ubiquitous, yet their far-reaching impacts on wildlife and human health continue to go unregulated. The introduction and spread of seed-delivered pesticides to major field crops, beginning around 2003, caused a massive increase in total neonicotinoid use nationwide. As of 2011, 34 to 44% of soybeans and 79 to 100% of maize acres were planted with coated seeds, accounting for an astounding 35-fold increase in nationwide neonicotinoid use from baseline rates prior to 2003 (Douglas and Tooker, 2015). Alarmingly, because the national pesticide survey conducted by the National Agricultural Statistics Service fails to include seed-applied neonicotinoids, i reports give the misleading impression that neonicotinoid use has declined over the past few decades. Seed coating technologies have dramatically altered the landscape of pesticide contamination nationwide. U.S. croplands are currently planted with roughly 3.5 million kilograms of neonicotinoid-coated seeds each year (Tooker and Douglas, 2017). On top of causing massive increases in the total extent and per-acre rate of neonicotinoid application, seed treatments increase the proportion of neonicotinoids applied that enter soil and groundwater. From 90 to 99% of active ingredient delivered through seed treatments is lost to air, soil, and water –including environmental losses caused by the release of contaminated seed dust during mechanical planting (Wood and Goulson, 2017). Neonicotinoids in seed dust can reach concentrations up to five orders of magnitude higher than their acute contact LD50 values, leading to documented mass honey bee poisonings (Wood and Goulson, 2017). Inaction by EPA has led state regulators to avoid investigating these bee deaths from exposure to dust from planting seeds treated with neonicotinoid insecticides. Neonicotinoid-coated seeds pose far-reaching risks to wildlife, above and beyond those posed by neonicotinoids delivered in other forms. In EPA’s 2017 ecological assessment of neonicotinoids, coated seeds in particular were identified as posing the highest dietary risks to birds –exceeding the agency’s level of concern as much as 200-fold. 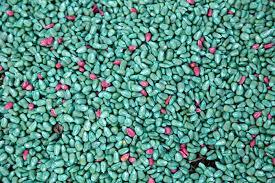 There is substantial evidence that neonicotinoid-coated seeds cause unreasonable harm to aquatic invertebrates – the foundation of healthy aquatic ecosystems. An EPA Aquatic Risk Assessment for imidacloprid, released in 2017, found that imidacloprid threatens the health of U.S. waterways with significant risks to aquatic insects and cascading effects on aquatic fo od webs. In addition to threatening wildlife, the widespread use of neonicotinoid-treated seeds also puts human health at risk. The mass leaching of seed-delivered pesticides may lead to unreasonable adverse effects on public health via contamination of drinking water. Recent studies have found neonicotinoids pervasive in finished drinking water (Klarich et al. 2017; Sultana et al. 2018). Alarmingly, University of Iowa researchers found that finished drinking water frequently contains metabolites of the neonicotinoid imidacloprid that have never been evaluated for their potential risks to human and environmental health. Experts warn that these metabolites may morph further into new forms of chlorinated disinfection byproducts during routine water treatment processes, with potential for high toxicity to humans due to loss of insect specificity. The continued under-regulation of treated seeds is in violation of EPA’s federal mandate to regulate and fully assess the risks posed by pesticides as they are commonly applied. I urge you to tell EPA to regulate systemic insecticides as they are most commonly applied through treated seeds, in order to comply with FIFRA and adequately protect the environment and public health. The agency is currently considering public comments on this issue and your voice is critical to public health and environmental protection. The Environmental Protection Agency (EPA) is under public scrutiny for failing to regulate pesticide-treated seeds, which by now comprise roughly 95% of total neonicotinoid use in the U.S. EPA is misusing a regulatory loophole – the “treated articles exemption” – to allow systemic insecticides to be used in mass quantities, without regulating or labeling them as required under FIFRA. Seed coating technologies have dramatically altered the landscape of pesticide contamination nationwide. U.S. croplands are currently planted with roughly 3.5 million kilograms of neonicotinoid-coated seeds each year (Tooker and Douglas, 2017). On top of causing massive increases in the total extent and per-acre rate of neonicotinoid application, seed treatments increase the proportion of neonicotinoids applied that enter soil and groundwater. A review of the literature indicates that 90 to 99% of active ingredient delivered through seed treatments is lost to air, soil, and water –including environmental losses caused by the release of contaminated seed dust during mechanical planting (Wood and Goulson, 2017). Neonicotinoids in seed dust can reach concentrations up to five orders of magnitude higher than their acute contact LD50 values, leading to documented mass honey bee poisonings (Wood and Goulson, 2017). Inaction by EPA has led state regulators to avoid investigating these bee deaths from exposure to dust from planting seeds treated with neonicotinoid insecticides. Treated seeds lead to unique exposures, such as through seed dust, and unique contamination of surrounding vegetation, soil, surface water and groundwater, with far-reaching consequences for wildlife and human health. The continued under-regulation of treated seeds is in violation of EPA’s federal mandate to regulate and fully assess the risks posed by pesticides as they are commonly applied. Please tell EPA to fulfill its federal mandate and regulate pesticide-coated seeds, as they are commonly applied. Anything less falls short of adequate protection under the law. This entry was posted on Monday, March 25th, 2019 at 12:00 am	and is filed under Agriculture, Environmental Protection Agency (EPA), neonicotinoids, Take Action, Uncategorized. You can follow any responses to this entry through the RSS 2.0 feed. You can skip to the end and leave a response. Pinging is currently not allowed.